Lanxess is investing in its production facility for ion exchange resins at its Leverkusen site. Photo: Lanxess AG. Lanxess is making a seven-figure euro investment in its ion exchange resin production facility in Leverkusen, Germany to optimise its process technology and operating efficiency. The project is scheduled for completion in the first half of 2019. 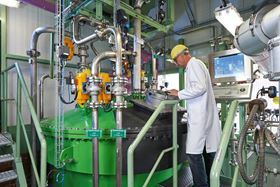 The Lanxess Liquid Purification Technologies (LPT) business unit operates additional ion exchange resin production plants in Bitterfeld, Germany, and in Jhagadia, India. Lanxess also manufactures reverse osmosis membrane filters in Bitterfeld. LewaPlus 2.0 enables users to combine different technologies in one design.